The Jersey City Environmental Commission (JCEC) is comprised of volunteer city residents who are appointed by the Mayor to serve three-year terms. The JCEC was re-established in 2011 to promote the protection and conservation of land, air, water and other natural resources within the City, and to educate the public and advise city government about the best methods for protecting and conserving these resources. Read agendas and minutes of both past and up-coming Environmental Commission Meetings. The Environmental Commission encourages people to come and comment at the EC’s monthly meetings. Listed here is a schedule of the upcoming meetings for the Jersey City Environmental Commission. All 2019 meetings will be held in City Hall, 280 Grove Street, Jersey City at 6:30 p.m. 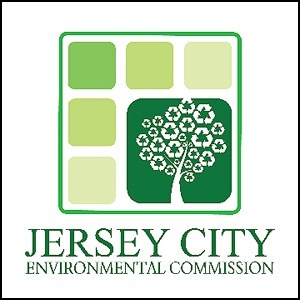 In 2015 the JCEC and the City's Division of Planning began working with the School of Environmental and Biological Sciences and the Center for Urban Environmental Sustainability (CUES) of Rutgers, The State University of New Jersey, to conduct an updated Environmental Resource Inventory for Jersey City. This valuable document contains a comprehensive inventory of the City's environmental resources, including physical, biological, and selected cultural characteristics. Jersey City’s tree canopy was mapped and analyzed as part of the Jersey City Environmental Commission’s role of inventorying environmental resources and promoting long-range planning. The strategies presented herein are intended to protect and expand the city’s investment in its trees in order to create a cleaner, greener, more livable and vibrant city for everyone. Download Tree Canopy Assessment here. Green infrastructure initiatives like green parking lots, green streets, pervious pavement, and rain gardens have been shown to reduce sewer overflows by up to 80%. In addition, including green infrastructure can reduce the amount of money the City spends managing and repairing its stormwater systems. The JCEC has recommended that the City review its land use and zoning ordinances to include green infrastructure. Read the JCEC’s recommendations on green infrastructure initiatives here. The creation of a new stormwater fee is an effective way of redistributing the cost of stormwater management to the properties and facilities that generate the most stormwater. Currently, the properties that produce the most stormwater run-off, like malls, parking lots, and highways, often contribute the least to maintaining the stormwater system. By creating the new fee, those sites with the largest non-porous areas will be encouraged to reduce their stormwater runoff with green infrastructure. The new fee will also create a new revenue stream to pay for sewer upgrades and green pilot projects. Read the JCEC’s recommendations on the new fee here.